Lab coats are what patients look for to distinguish clinicians from everyone else who works in medicine. A recent experience illustrates my point. I had been referred to a specialist’s medical practice I’d never been to before. From the time I entered the clinic I surveyed the numerous uniformed personnel all of whom were wearing scrubs and busily performing various clerical tasks, interviews, preliminary procedures, prep, etc. I was searching for people wearing lab coats. I wanted to see what my doctor looked like, size him up, get that first impression. I knew that scrub tops with two pockets in front indicated they were nurses or technicians. After 30 minutes, I still hadn’t seen anyone in doctor’s scrubs or a lab coat. I began to wonder if he was even in the office. Perhaps he’d been called away on an emergency. There were lots of medical personnel, but no lab coats. Part of my interest in identifying this particular doctor stemmed from my wife’s comments about what a favorable impression he made on her. She met him for the first time when she had been referred to him a few months earlier. She reported he was one of the most impressive doctors she had met in some time. I asked her the basis for her observation. She told me how thorough, knowledgeable, caring, and efficient he was. She also noted how well dressed he was. I care about competence and attitude too. But strange as it may seem, I also care about how well a doctor’s dressed, as I have long been of the belief that high personal appearance standards often reflect high professional standards. That basic tenet had served me very well as an executive in a business career that has spanned decades. When what seemed like every conceivable preliminary form, question, test and evaluation imaginable was completed, my doctor walked into what must have been the third or fourth exam room through which I had been processed. I was warmly greeted by an immaculately dressed physician in whom I quickly gained confidence. His exam was exceedingly thorough and unrushed. His manner was relaxed and comfortable. As for his appearance, I’ve seen lots of lab coats in my day. (I served years as Chairman of the Board of a very successful hospital and an officer on related medical companies, and hospital groups.) But this lab coat really was impressive. Someone once told me that, when properly done, wearing a lab coat can be like wearing your diploma. The truth is, as most people in medicine well know, most lab coats are cheap, simple, utilitarian garments that usually are such junk that the people wearing them would never be caught in such third rate apparel for a social occasion. Yet, they wear these frumpy non-functional lab coats every day to work, to greet their patients and work beside their staff and peers. It is simply incomprehensible to me. This particular doctor obviously recognized that making the extra effort to find a quality lab coat represented an opportunity to make a very positive statement. From the subtle texture of the fabric, to the pristine white color, to the impeccable embroidery, to the exquisite, sophisticated, refined, yet understated tailoring and perfect fit, you couldn’t help but take note of it. 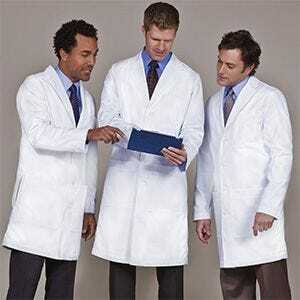 Lab coats are available these days from what seems like an infinite number of outlets. The message I’m taking away from this experience, however, is there’s only one source that matters if you believe as I do that investing in quality lab coats yields an extraordinary return on investment. I asked the doctor who made his lab coat. He smiled, having been asked the question before, apparently, and told me it was from Medelita Mens. When I got home I checked out the website, www.medelita.com and saw that it was different from virtually every other lab coat source I had ever seen. The number of unsolicited testimonials from clinicians was astounding. Even their lab coat guarantee was different – instead of 30 days, their lab coats are guaranteed for a year! But frankly, after seeing the coat, I wasn’t all that surprised. If you share the view that personal appearance standards influence the perception others have of you, and you wear doctor’s scrubs or a lab coat, you owe it to yourself to learn more about the exceptional medical apparel available from Medelita.